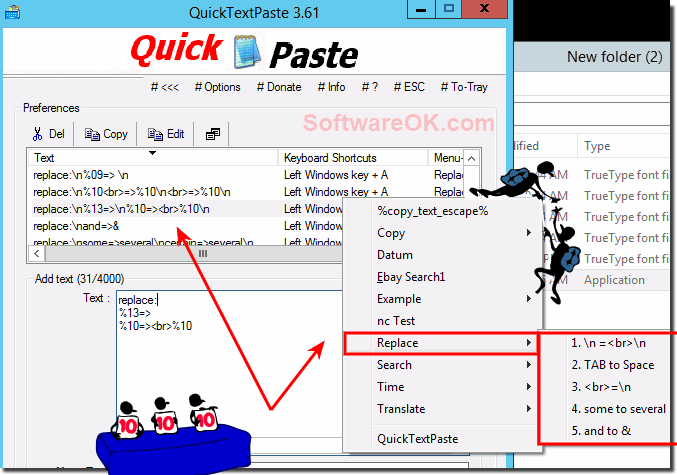 Create sub-menus for multiple commands in QuickTextPaste from Version 3.61, for all Windows OS! 1.) ... Create Sub-Menus for inserting of many texts! 2.) ... Activate tool tips to better recognize the text! See also: Use right, left, middle mouse button as clipboard friend! 1.) Submenus for inserting texts create! Please don't use the / in Menu-Text if you don't want sub-menus, yes just figured this out, not to use / in menu-text but I can still use them in Add Text! (Image-1) Create sub-menus for multiple commands! 2.) Activate tool tips to better recognize the text! Just activate the tooltips for menus via the options menu! (Image-2) Activate Tool-Tips in sub-menus for multiple text commands! As you can see above in Windows 10 and 7 shot screenshot, it is easy to activate the tool tips. However, you can easily apply this example to earlier and older versions of Microsoft's Windows operating systems to better understand the text that you want to paste, whether you use the tool tips on a Native Windows desktop or the text to go in the Starbucks or other coffee shops on the tablet PC, Surface Pro / Go, or even to use in on a server operating system in a security area. 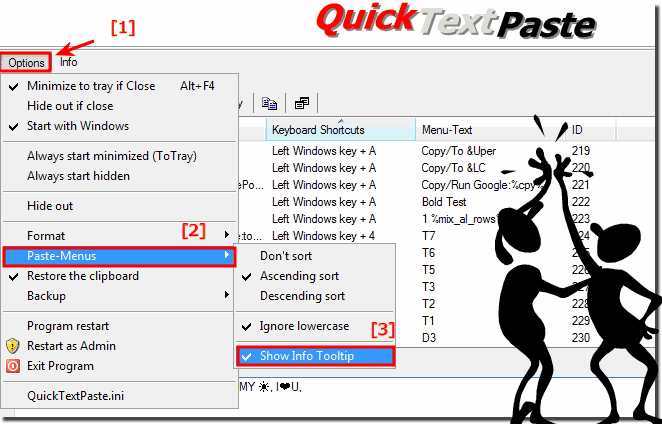 QuickTextPaste - FAQ-22: Create sub-menus for multiple text commands!